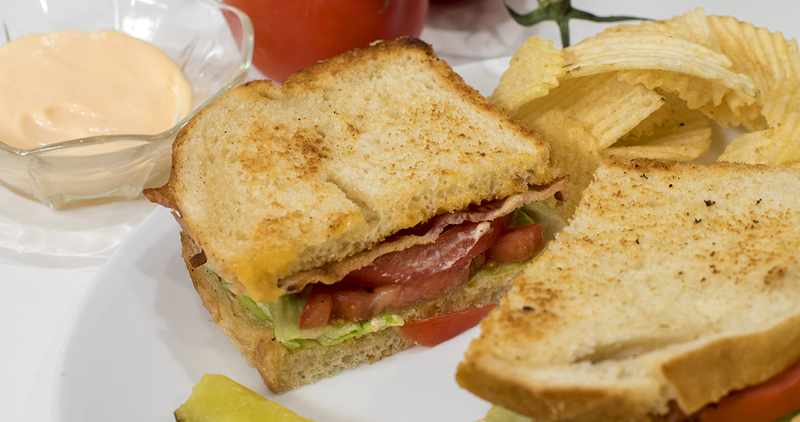 Add your favorite North Carolina hot sauce to mayonnaise to give your BLT a creamy kick. Combine mayonnaise, hot sauce, and lemon juice in a small bowl. Set aside. Cook bacon in frying pan until crispy. Pat bacon dry and drain the pan’s excess grease appropriately. Toast two slices of thick country bread in the same frying pan, flipping once halfway through toasting. Spread a thick layer of the hot sauce-mayonnaise on both pieces of toasted bread. Add the tomato slices and sprinkle with salt and pepper. Arrange bacon and lettuce on top. Cut the sandwich in half and serve. Lowes Foods created a shopping cart with this recipe’s ingredients for your convenience. Click the button below to simplify your next trip to the grocery. Lowes Foods supports local businesses because it is one. As the truly homegrown, Carolinas-based grocery store since 1954, Lowes Foods proudly brings community to the table by providing guests the freshest local products from farms and businesses in the South. Today Lowes Foods operates over 100 full-service supermarkets and employs nearly 9,000 people, but remains as committed as ever to one thing: bringing together the very best of everything local. To learn more, visit www.lowesfoods.com or follow Lowes Foods on Facebook or Twitter.